The advent of digital technology allowed a greater exchange of knowledge and ideas to enter homes at an astonishing new level. This change brought information and services straight to users that before may have required someone to actually leave their home to seek it. The advancement of mobile computing technology furthered the trend of information coming directly to people but without restricting its access in one physical place. Many cultural heritage institutions have noticed these changes and adapted to become not only places that house information, but resources that increasingly push it directly to their patrons wherever they may be. The affordances of this new media also allow institutions to bring their materials into geographic space, adding another layer of interpretation and context while bringing to the public’s attention that history is all around us. One site that takes advantage of mobile application and a spatial understanding of history is Histories of the National Mall created by the Roy Rosenzweig Center for History and New Media run using our old pal, Omeka. Taking their own advice from their report Mobile for Museums, the site is device independent, made to run on a web browser allowing for use across desktop, laptop, and mobile and is not a native downloadable app that needs tailoring for each device. As the title indicates, the site is an interface for learning about the histories of the national mall through maps, explorations (short examinations based on questions people might have about the mall), people, and past events. Most of these sections can be filtered into different historical periods. Some of my favorite sections, and much to my chagrin, are the great explorations of unmade designs of the national monuments. There are also a number of scavenger hunts that send you to a specific part of the mall and have images of places for you to find. Once you find the images, you tap or click them and can read or listen to more about it. The key feature of this site is the map, which has over 300 points containing historical information, audio, video, images, and documents. The user can filter by each of those categories as well as by place and event. As stated above, the site is web browser based and largely looks the same when using on a desktop/laptop or a mobile device. Using GPS, Histories of the National Mall centers the map on the user’s coordinates and locates them within historical context. What is good about the map is that there are no set way to explore the points, you can wander around and discover new facts and events that shaped the environment all around. This allows the user to set their own narrative in a serendipitous combination of explorations. While Histories of the National Mall is a ready made site, Aris Games is both an open source application to create geographically based games and a mobile app to play the games. The back end is not the scary coding or programming that some in the cultural heritage sector may fear, but a simple interface so even those without the technical skills can make the games with the infrastructure invisible to them. 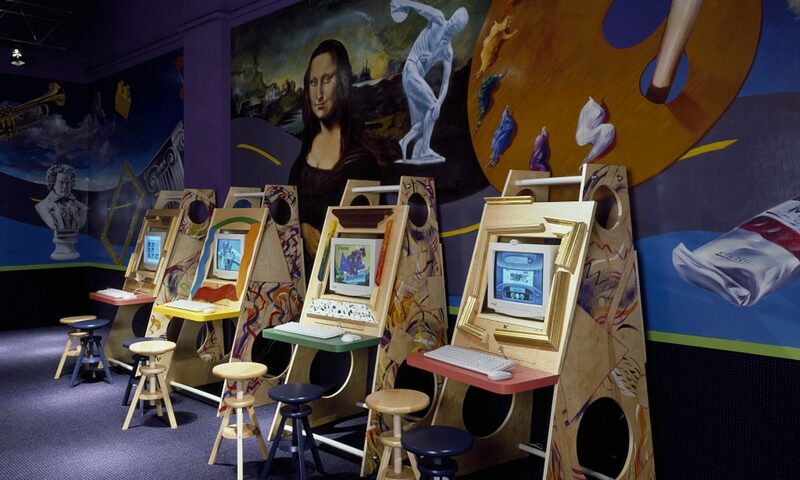 One downside to the Aris created games not encountered in the mall histories site is that the mobile app is only available on Apple products and has a much more limited audience because of it. The Aris editor interface to create is simple but it is by no means easy to understand without first reading the manual or viewing the helpful video tutorials on certain topics. It is important to understand the different elements (especially non-obvious ones such as scenes, plaques, and locks) and how they function so you can create a working game. The games are largely tours or explorations of certain areas. Building a game is based on creating “scenes” or different scenarios that the user can encounter as they travel around. You can make conversations for the user to have at each location that can lead them further into the game. All of the features you create can be mapped to a certain location to create an exploratory geographic environment. This feature is unfortunately cumbersome to use as the only way to find your points is through precise GPS coordinates or by dragging the point to where you want with no way to search for your general location so you can get there quicker. Also there is no way to see how your game will look in app without having and opening the app. Since I have an Android device, I needed to borrow an iPhone to do this. Despite these drawbacks, Aris editor is a good way to make games without requiring programming experience. Overall, National Histories of the Mall and Aris Games are good examples of the creative ways spatial history and mobile technology can work together to engage the public. By embracing this new trend and the ubiquity of mobile phones, institutions will add layers of meaning, attract a wider audience than before, and bring content out from behind closed doors. Google Books has currently digitized 15 million books (and counting), or 12 percent of all books that have been published in history. While impossible to read this vast amount of literature, the tool Google Ngram allows any user with the click of a button to search linguistic trends spanning centuries. Created by a team of researchers centered at Harvard, Google Ngram uses 5,195,769 books (roughly 4 percent of all that have been published) to conduct quantitative analysis of their contents, referring to this as “culturomics.” The concept and interface of Google Ngram is easy to use. Below is a search for the word “history” in American English. Ngram allows you to switch between different languages like Russian, Spanish, or Chinese. Ngram also allows for comparisons between American and British English, and regular English and English fiction, which can make for fascinating results. Ngram contains the option “English One Million” which narrows your search to 6000 books per year from 1500 to 2008 for a more focused search. The user has the option of selecting from which years to search. Ngram gives you the option of “smoothing” the yearly results – which streamlines your results by averaging the occurrences of your search in the years immediately before and after each date on the results graph. I found the default smoothing of three to be effective. Perhaps someone with a better grasp of statistics could better explain this to the class? It seems there’s more interest in “history” in the late 1990s than in the past 200 years! Ngram also gives the user the opportunity to download the datasets on which it is built. For each language, the datasets for each “gram,” 1-5 terms long may be manipulated for further experiments. Although I had some difficulty doing this, it seems admirable that the creators of Ngram provide this to the public. Currently, the datasets available are from July 15, 2009, when Ngram was first created. 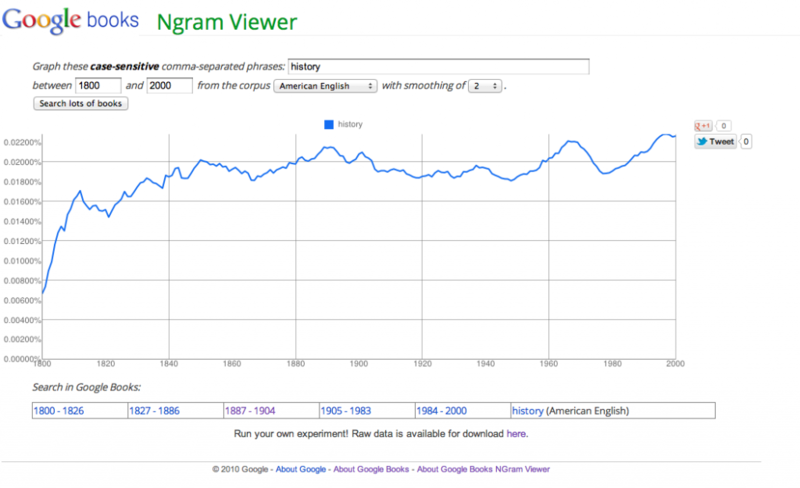 Ngram opens fascinating possibilities of research to historians. As mentioned in the Michel, et al. article, Ngram gives the opportunity to track the usage and evolution of words through printed history, and even government censorship, as in Nazi Germany. 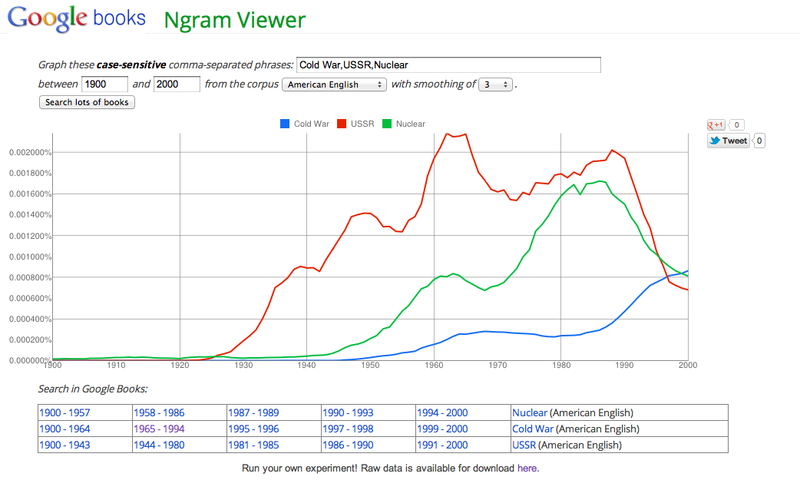 Below is another Ngram I ran comparing the use of the terms “USSR,” “Cold War,” and “Nuclear” in American English. It is interesting to see that by 2000, after the fall of the Soviet Union, the term Cold War has surpassed the other two. After having experimented with this tool, what are your impressions? Are there shortcomings to how Ngram can be of use to historians? Ngram does acknowledge that information before the 1700s can be skewed because few books were published during this time. How do you envision using a tool like Ngram in your projects in the future? Lev Manovich is an accomplished thinker in the field of new media. In his short piece, “Database as a Genre of New Media,” he makes the case that databases represent a fundamental paradigm shift in the way that people think about the organization and presentation of information. Databases as a non-narrative, not necessarily linear way of organizing data did not originate with the digital age – they were found previously in, say, encyclopedias or photo archives – but they have experienced a renaissance in that time. Video games, your hard drive, and the Internet are all databases, and they all represent a way to present data free of the constraints of logic and coherence imposed by the narrative form. Manovich argues that since databases are free of the “cause-and-effect trajectory” of the narrative form, they can, through ever-increasingly complex organizational forms come to represent a more complete simulacrum of reality. The implication of his vision seems to be that databases will mimic real-life systems in incredible detail – a city, a historical figure, or even a whole historical society – and users will be able to interact with these simulacrums in apparently natural, non-narrative ways. Imagine – if, instead of writing an exhaustive three volume biography of Theodore Roosevelt, Edmund Morris had programmed the entirety of his research into an algorithm which imitated Teddy himself. Students of history wouldn’t need to read about Teddy – they could go bear hunting with a database that simulates his appearance, his behavior, his patterns of speech in virtual reality. In this way, they could experience the man as he was – Teddy 2.0 would not shoot that simulated bear cub either. Am I getting this right? Each method – narrative and database – has its own merits to recommend it, but as the genre of database evolves into ever more sophisticated forms, narrative as a construct is likely to fall more and more by the wayside in favor of organizational techniques better suited to their unique matter. A little help – am I overstating his argument? Missing it completely?